Quick overview: An overview of the Magic Pen tool found in the SMART Notebook software. Basic technique. 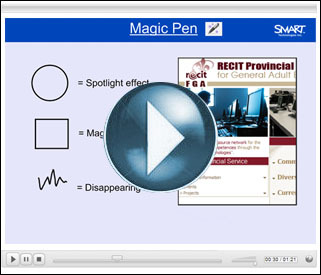 How can it be used in the classroom: The Magic Pen tool can be used in three ways. If you draw a circle with the Magic Pen, it will create a “spotlight” effect to highlight information on the screen. If you draw a rectangular shape with the Magic Pen, it will magnify selected areas of the screen. Lastly, if you use the Magic Pen to draw freehand, the ink will act as “disappearing ink” and fade away after a few seconds. This entry was posted in IWB and tagged iwb, magic pen, smart board, SMARTBoard, tool. Bookmark the permalink. « ICT Tip: A website with over 1,100 video tutorials covering basic arithmetic, algebra, physics, chemistry, biology and finance!